Taking its source in one of the world's richest civilizations, China has been and remains an unrivaled scientific and artistic crucible. Indeed, China is at the origin of a number of major inventions, such as the compass, the banknote and the papermaking, that helped revolutionize the world's progress, especially in the fields of trade and economy. This Chinese creativity has survived throughout history, inducing one of the fastest economic developments in the world. Such dynamism is a model for many African countries facing the same challenges that China faced just over 25 years ago. In recent years, cooperation between China and Africa has been remarkably dynamic, to the point of becoming a model of sustainable partnership for inclusive and common development. Such partnership is not only pragmatic, but also very effective since it is essentially oriented toward the priorities defined by Africans themselves. This has been possible because relations between Africa and China are based, on the one hand, on mutual respect and understanding and, on the other hand, on the similarity of their trajectory. It is an encounter between the cradle of humanity and one of the oldest human civilizations, both of which have shown great resilience in the face of the numerous ups and downs in their respective histories. This is the relevance and the significance that should be given to the Forum on China-Africa Cooperation, whose next summit will be held on September 3-4 in Beijing. This exceptional platform offers a framework for fruitful exchange between China and Africa, for which this partnership is dynamic, particularly in the fields of infrastructure, energy and industry. Sino-Senegalese relations, which as of today have been upgraded to a comprehensive strategic partnership, are fully in line with this framework, while having their own special bilateral dimension. 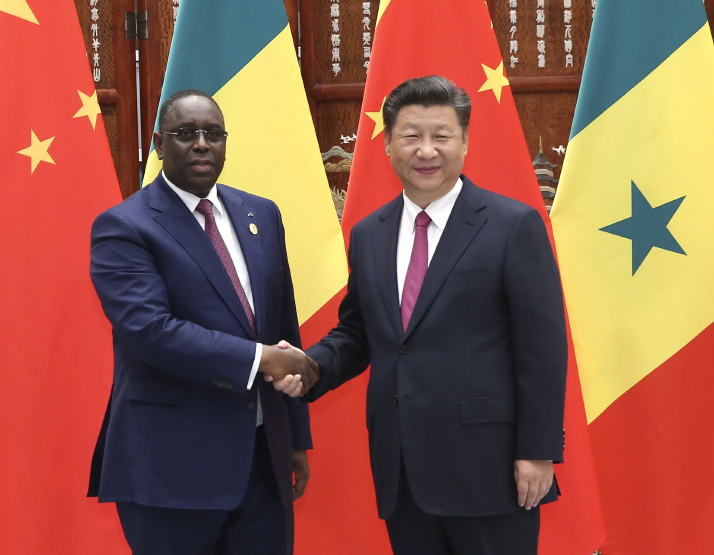 The great relations between China and Senegal are based, on the one hand, on mutual trust and respect between Chinese President Xi Jinping and me and, on the other hand, on the friendship that bonds our two peoples. This is why our cooperation, in addition to its economic dimension, also includes cultural aspects. This is eloquently symbolized by the construction of wonderful buildings such as the Grand National Theater and the Museum of Black Civilizations. It is also evident in the healthcare and sports sectors, with the construction of the Diamniadio Children's Hospital, the National Wrestling Arena and the refurbishment of 11 regional stadiums. In addition, China donated 2,000 decorticators and grinding mills and completed a drilling program totaling 251 wells as part of the hydraulic component of the Third Phase of the Urgent Community Development Program. Of course, we should also mention the two most important infrastructure projects that Senegal has undertook since its independence, namely the Thiès-Mbour-AIBD Highway and the Ila Touba Highway. All of these make the relations between Senegal and China particularly important to me. This is the basis of my unyielding willingness to work on a daily basis to strengthen Sino-Senegalese cooperation with my counterpart and friend President Xi, whose visit to Dakar in July will be a special opportunity to further strengthen our relations. Already, I would like to extend a warm welcome to President Xi to the land of Téranga [a Wolof word meaning hospitality].